Fast-sinking, heavy, braided hooklinks are favoured by many big fish anglers in the know because it will naturally settle flush to the lake or river bed. By combining this with an excellent camouflage colour, we have created a very special hooklink that has proven hugely successful during development and immensely popular with some of our field testers. 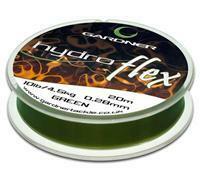 It is superbly strong, using ultra-reliable Dyneema for a fine diameter and superb knot strength, with a smooth finish and soft, supple feel. This flexibility not only ensures unrestricted free movement of the bait at the critical moment that the fish inhales the hook bait into its mouth, but also helps it lay down tidily, out of the way where it is less likely to be noticed by one of these tricky-to-catch, cautious feeding fish. 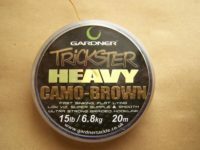 Trickster Heavy excels as an alternative to the skinned style hook links that the fish see very regularly on the river/lake bed, and comes into its own when used for solid PVA bagging. Top Tip – try a short Trickster Heavy hooklink when fishing particles on, as you can go short without impairing the hook baits movement.